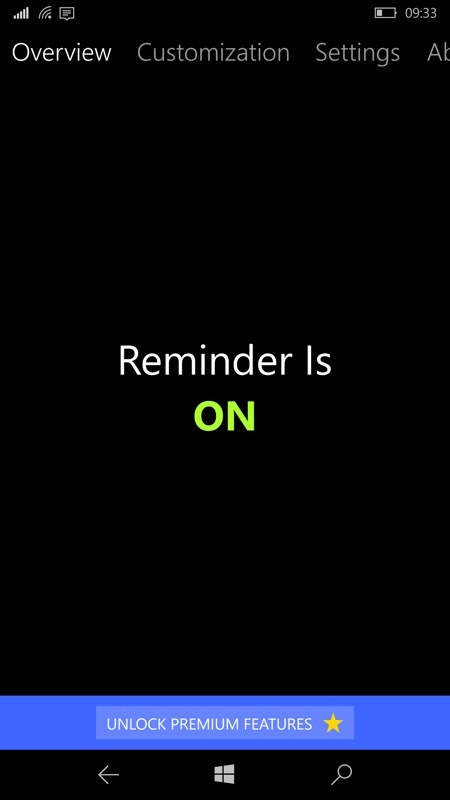 The idea's a good one for the modern age - a phone-based reminder to stand up and take a break, rather than spend hours in a chair at a computer (or on the sofa!) 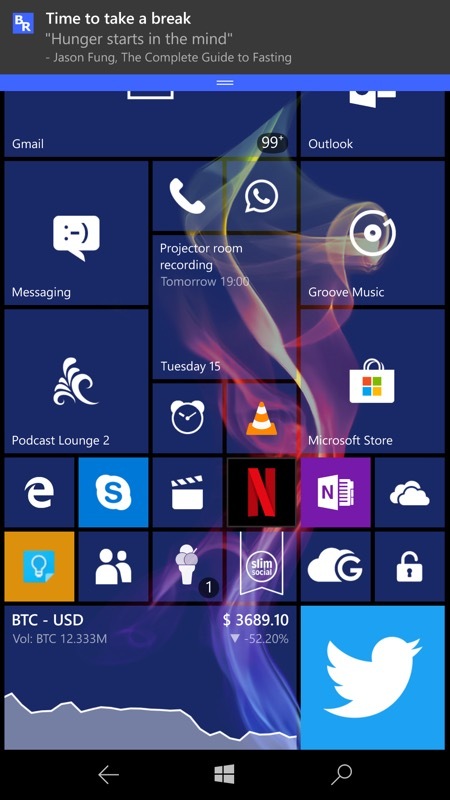 So here's a UWP application for Windows 10 that delivers the needed prompts. And it's currently free in the Store, so grab it now rather than later! Whatever activity you are doing, you need to take a break at some point, to relax yourself, but when you are focused on your activity, you tend to forget about breaks, and in the long term this can affect your health, badly! 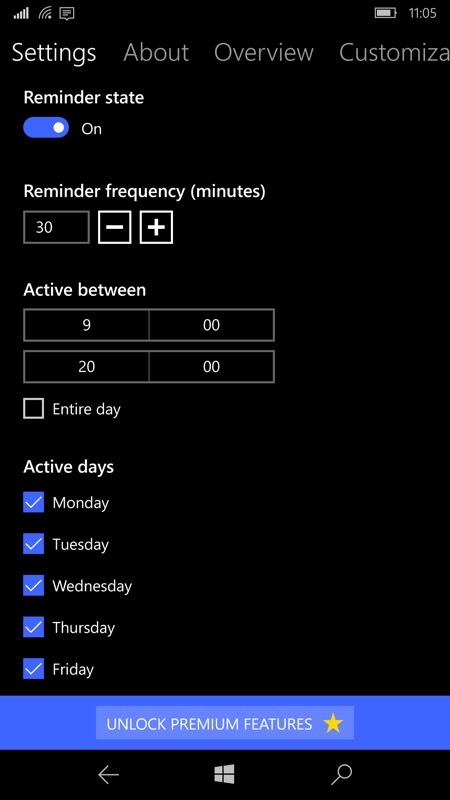 Once working normally, this is all you see of the main UI, which effectively turns reminders on, and (right) lets you set up how often and when you need to be reminded to 'take a break'. 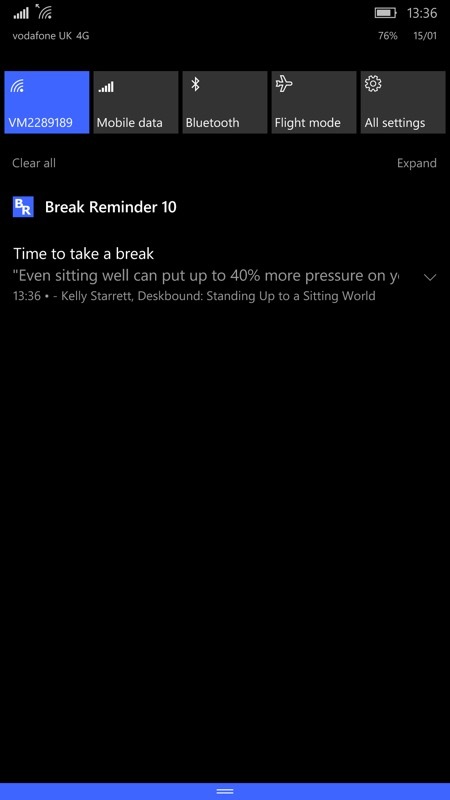 At the appropriate interval, a toast message pops up in the Windows 10 Mobile UI (or on your laptop screen, this works on all UWP-capable devices), with a corresponding reminder in your notifications. The 'break-related' literary quotes are a nice touch. The in-app-purchase to go 'premium' is a nice thought, to allow extra customisations, for people that use the app regularly, but there's currently only a recurring 'dollar a month' subscription. I don't know about you, but I cant STAND these. Just give an amount that the features are worth and I'll pay it. For example, $5, $10, anything - just don't force yet another monthly subscription on my stressed out life. What's your opinion on these? 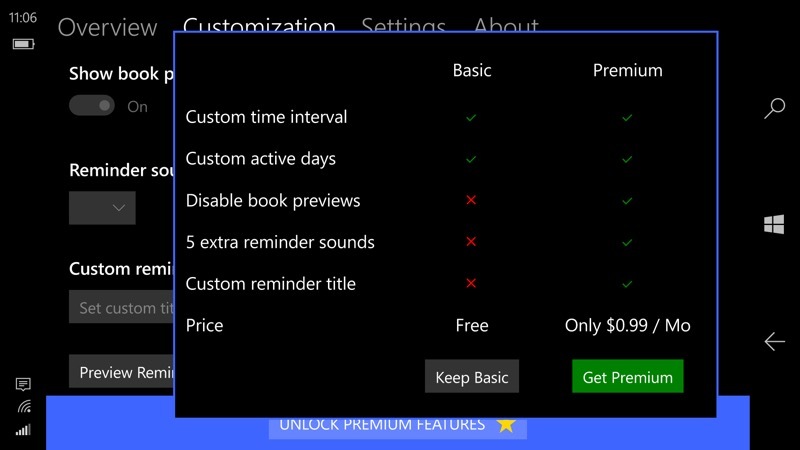 You can grab Break Reminder 10 UWP, for Windows 10 phones and laptops, here in the Store. It's currently showing as 'free', but there's a struck out £1.69, so I guess this may come in at some point. Though see my notes above about the 'Premium' payments, even if most people won't need these.